Oh, I've also forgot in the PM, happy new year! EDIT: Also updated the first post! Happy new Year to everyone !! That will be done once the final release is, well, released. There's a bunch of unsolved issues, but I've made sure to acknowledge many of Gig's points. Some of them I couldn't acknowledge because the maps have compile issues or other issues. Do you have a list of them? PS: Happy new year to everybody! 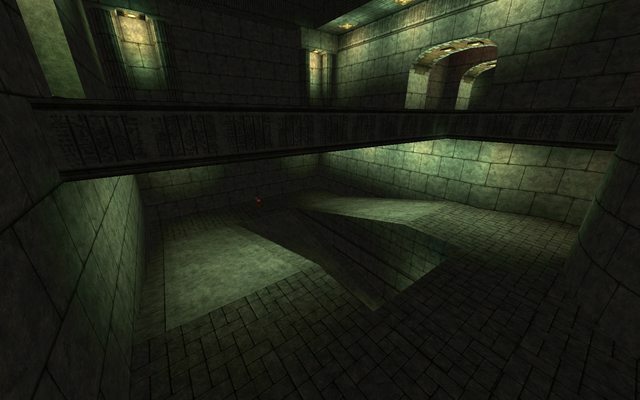 Basically I could only solve issues in the maps I've managed to compile, both of Moixie's maps and Akom's dm1. Uhm... I did the first try with adding "ambient" to worldspawn. You can try udestructionV17bis (ambient 10) and udestructionV17ter (ambient 5), attached to this post. 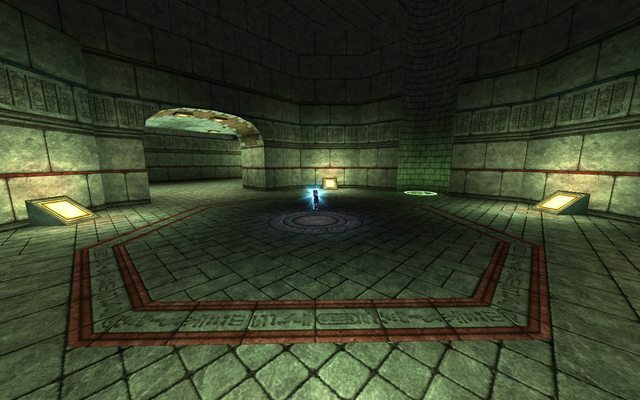 "Ambient" light is the only change against Udestruction Version 17. But maybe I did something wrong... compiling did not slow down as I thought, and comparing a screenshot taken with V17 and V17bis seems exactly the same (screenshot taken at the initial player spawn)... but for some reason my system takes very bright screenshots. Your opinions? Do you notice differences? Which "ambient" values should I try? Note: they are just tests. Official version is still V17. UPDATE (see this post): It looks like these versions change nothing, maybe due to I forgot the "_color" key. I will do other tests in the next days. Instead of ambient light, what about using _minlight, _minvertexlight and _mingridlight? They look more natural than ambient light. I don't know about them. I have to search for some documentation (and to check if they are supported by q3map). I will do more tries in the next days. For the moment, I did a try with "ambient 100" and it seems it changes nothing. I forgot to set "_color" key, maybe it is the reason Ambient did not work? It looks like I will have to work, in the next days. D'oh! I have to go now, happy new year everybody! Update: a test with "ambient 200" and "_color" key set (to the value of the "light" entities around the map) actually changed the map. The result seems like I did compile it the fast way (all shades are gone, and the map is too green), but at least it's an indication the problem may have really been the lack of "_color" key. However, also this one seems to do not slow down compiling, maybe I really remember wrong about that. I've tested RC2 a bit. oa_akomdm1 (updated version): the fog is back, the map is good, and I like new brighter lighting. I've seen no issues, except for bullets passing through lizard statue, but that's minor one. oa_akomdm2: it's the same as I remember it, no issues. It sometimes difficult to spot a bot on a sky background, but that happens on all space-themed maps. Also, the sky is better than on other space-themed maps. 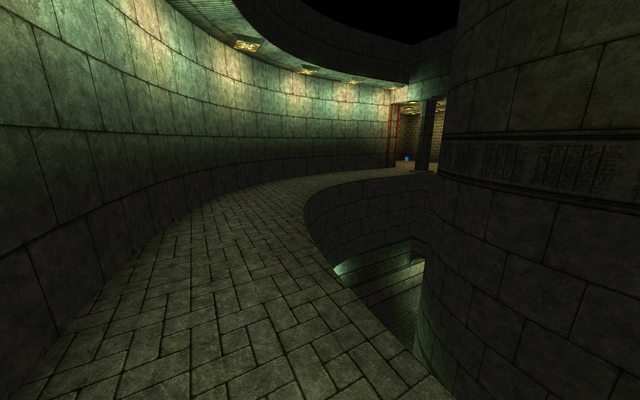 oa_akomdm3: best map ever it seems there were no changes from previous release. And I absolutely don't mind symmetric maps. It still has a plain black sky, there are not many places where you can look at the sky, but I would still prefer an excellent sky from oa_akomdm3. That's minor complaint though. I'll test other maps soon. oa_akomdm3 will have support for One Flag CTF and Harvester. The map asks for it. Also, it will have new lighting and many optimizations. I disagree, the map it's too little. 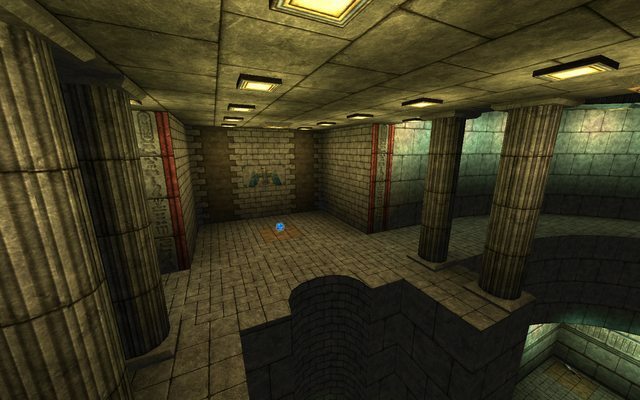 My suggestion is to make maps for a kind of game like UT. Example: DM-Akom3 or DD-Akom7 and CTF-Akomctf2. I disagree. 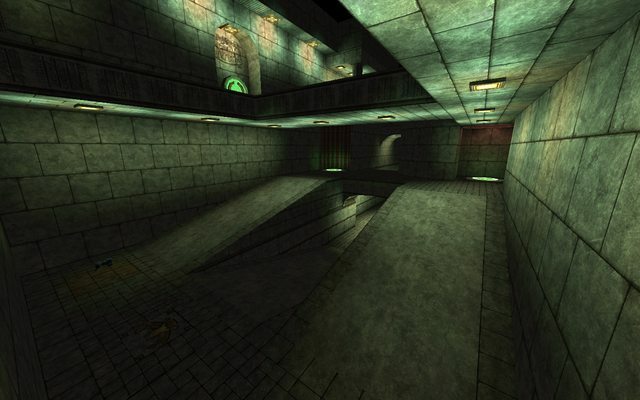 The map is already fine for such gametypes precisely because of the symmetry in both item/weapon placement and layout. Besides, those modes don't require a lot of players. Here are my first experiments on oa_akomdm3. So far, I'm not liking the lighting too much, those green spots don't look very natural, but I haven't thought of another adecquate color to contrast with yellow. The map has now support for 1FCTF and Harvester (it doesn't work too well with either regular CTF, Overload or DD due to that upper passage) and is optimized for higher framerates (it keeps the same layout shape as always, but there are optimizations such as detail brushes and patches, botplay is also optimized; I still have to place the Hint brushes). I'm not going to put yet my lighting experiments nor the new weapon/item placement for FFA-based gametypes into the official OACMP. What it's going to enter is the 1FCTF/Harvester support and the framerate/botplay-optimized layout. Are those screenshots a bit dark, maybe? Yup, too dark. Were you using gamma 1.0 for these screenshots? Yep, /r_gamma 1. Players should be visible with it, otherwise there's a problem with the map's lighting. Visibility with /r_gamma 1 also allows us to debunk the whole "WE NEED BRIGHTSKINS" complaint. For OACMP2 I shall write a list of recommendations for mappers. For starters, play with high quality settings (r_detailtextures 1, r_lightmap 1, r_flares 1) so they can easily spot troublesome areas. Also, r_gamma 1 to spot dark areas which need to be corrected. So, I tried with ambient 1, 5 and 10. Attached to this post, you can find a comparative screenshot (no ambient, 1, 5, 10). For some reason, this PC takes screenshots much brighter than what it shows the map while playing, I don't know the reason... so you have to imagine everything may be a bit more dark. However, these screenshots allow to see how fast do light/shadow differences disappear as ambient value raises (look at the upper right corner, in the lower part of the platform). I don't know what to do, I need your help. I really wish you actually download these pk3 files and test yourself. I'm not able to distinguish what is better to do. Keep current one, without ambient? Use ambient 1, 5 or something in the middle? Use with OACMP RC2, of course. Tests are divided into two separate pk3 due to maximum filesize allowed by the forum (second pk3 file in the next post). PS: Uhm... brightness is a strange, nasty beast.... looking at this forum page from a second PC, everything looks much darker than with the first PC. I can notice it also looking at those screenshots of oa_akomdm3 from NK (when I looked at them before, I used this second PC). I have not found a lot of documentation about them, yet. I have not understood if it's supported by Q3Radiant's Q3map (two of them are named at the end of this page, but that page is strange because it's not clear if it's about Q3MAP or Q3MAP2). _minlight : Minimum light value, levelwide. Uses the _color key to set color. Does not add unlike ambient. _minvertexlight : Minimum vertex lighting, levelwide. _mingridlight : Minimum lightgrid (dynamic entity lighting) levelwide. Do you have something more to say? Here's oa_akomdm3. In the end, I've decided to keep the original item/weapon placement. I'll think later on a dedicated FFA weapon/item layout, so the map doesn't play too symmetric. Like I've said, mostly optimization changes, sans Hint Brushes, plus support for 1FCTF/Harvester. Also, I've tried to improve the lighting. Screenshots soon. Gig, you don't notice any difference because you're using extremely short values values. With 1, 5 and 10 you can barely notice anything. 10 could be the lower, 50 the medium and 100 the highest. Here are the comparative screenshots of each of the cases with both "ambient" and the combination "_minlight"/"_minvertexlight"/"_mingridlight" with 10, 50 and 100 respectively. -fast in the VIS stage is used only for testing purposes in your map, without it, your map takes hours to compile. It seems that it isn't properly optimized, but considering that it's your first map, we can forget it. If you prefer, I might take care of the lighting of the level. Gig, you don't notice any difference because you're using extremely short values values. With 1, 5 and 10 you can barely notice anything. 10 could be the lower, 50 the medium and 100 the highest. Uhm.... I do notice difference between my tests, the problem is that with the strange brightness I get on my machine in general (if I would keep r_gamma 1, most maps would appear dark in my machine), I'm not capable of determining where the lighting level becomes acceptable or not. Screenshots of my example above were taken, for commodity, at the initial FFA playerspawn point (to be sure they show the same exact angle), however maybe that part is not optimal for this testing (due to having few really dark areas), so I suggested you guys to actually try those versions of the map. Ambient values like 10 do seem to already wipe out shadows (looking at the back of the support for the platform on the upper right corner in my screenshots), I don't understand how an "ambient" value of 100 may be acceptable. 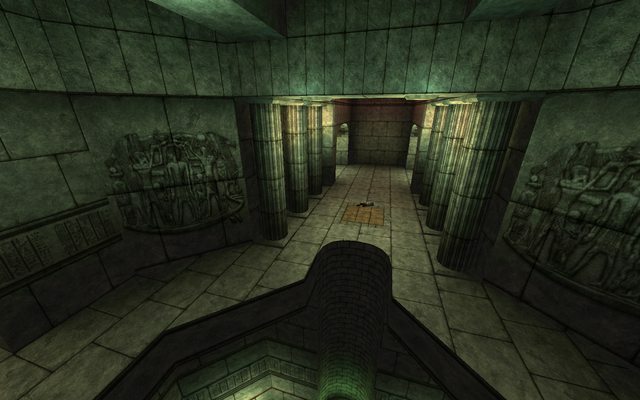 Maybe Q3MAP2 handles "ambient" in a different way than Q3MAP? 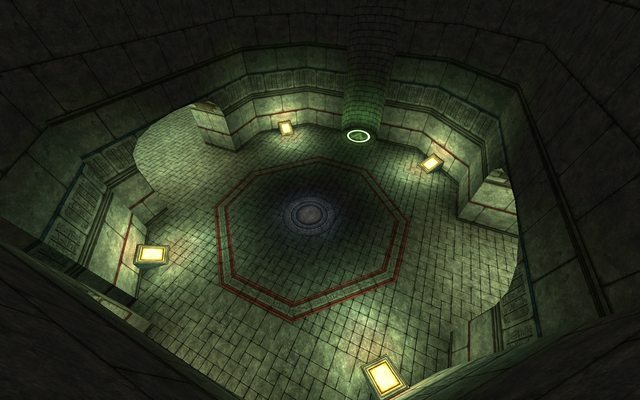 Here are the comparative screenshots of each of the cases with both "ambient" and the combination "_minlight"/"_minvertexlight"/"_mingridlight" with 10, 50 and 100 respectively. Do you mean that you did set all these three variables to the same value, changing it between tests? I'd like to avoid pitch black spots in my map, but I like the light/dark effects given by the "inclined sun": lighthing like that "minlight 50" or above seem to lose too much detail. Wait, what's that "-gamma 1.3" option? Is it possible to tweak map's gamma at compile time? - Somehow different results when compiling (different illumination, some textures scaled up, etc.). Not much help when I asked here, back to last Summer. I don't know yet. Are you sure my tests like "ambient1" and "ambient5" are still unacceptably dark? What do other people think? This is made with the same maps of my previous comparison test, but using another PC and another point of view (info_player_intermission). 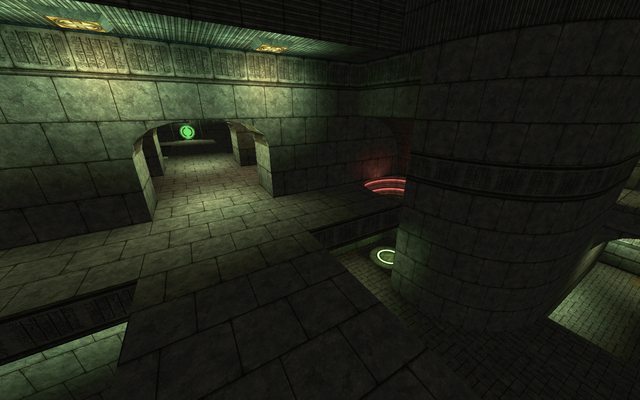 Map shown with ambient 0, ambient 1, ambient 5, ambient 10. I tried NK version of oa_akomdm3, in Oneflag and Harvester modes. Finally, a map which really applies the theory of the neutral flag/skull generator not in the middle of the map (not in the shortest path between two bases), but however equidistant from both bases. Maybe also oa_akomdm4 may be adapt to act the same (with the neutral flag placed on the front top of the ship). - In these modes (especially in harvester) some red and blue decorations should appear, to distinguish between bases. - The map is symmetrical, except for the secret passage, which in this case gives a shortcut to reach the white flag from one side only. A func-static block of the passage in these modes would prevent bots from using it also in other modes... Placing a second secret passage, maybe? - Now shotguns near to yellow armors do not spawn anymore. Compare first screenshot with second one (Akom-NK). Maybe that slightly raised plaftorm causes the shotgun to try to spawn in solid? - I think the map may support DOM and DD as well. For DOM, one example may be placing them in the places indicated by third and fourth screenshots (however that's just a possibility... different layouts are possible!). I know, also udestruction tries a similar thing with those modes, but the map is not symmetrical (it cannot be really fair), and that's just a try for a fun play than for a reach match. Akom's map seems more adapt. Time ago I noticed a way that allowed to know if a map had items that did not spawn due to trying to spawn in solid... loading the map and looking at the console output, under the ---- map loading ---- section it mentioned the XYZ coordinates where these problems were (and which kind of item had the "startsolid" problem). Doing it from a dedicated server session is even easier, due to the console showing much less unneeded data. This method (or even a better one, if existing) for detecting these errors may be mentioned somewhere in mapping-related wiki pages. Another notice about how strange brightness is. 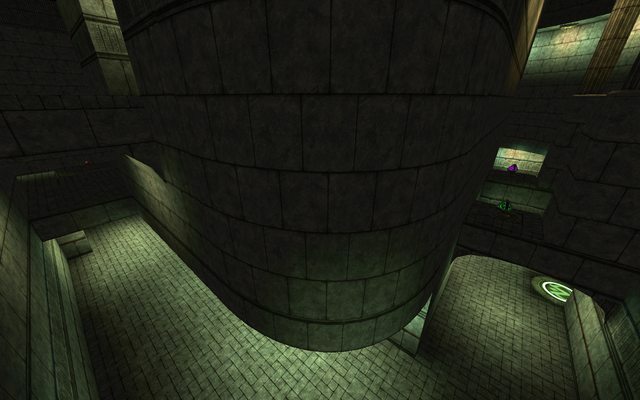 Here you can find two screenshots taken with the same udestruction version, with r_gamma 1.5, on the same machine. In fullscreen mode, SDL can change the brightness of your videocard output, essentially the same as if you go to Control Panel -> Nvidia settings, and tweak video brightness/contrast. In window mode it does not do that, because you have other windows on screen. The screenshot is still weird, because it should impact only electric signal in your monitor cable, but not the image inside video memory, so screenshots had to be the same.